Iwaki Battery Valley Festival was held over two days on November 25 and 26, 2017 with Iwaki Station Taxi Plaza as the main venue. Activities included test driving Fukushima Prefecture’s first “hydrogen-driven fuel cell bus”, a hands-on class for learning about the mechanism of fuel cells, demonstration by the robot car “Epollo”, which utilizes automatic driving technology, test driving the mounted mobility support robot INMOTION, and exhibition and test driving of electric vehicles and hydrogen vehicles. 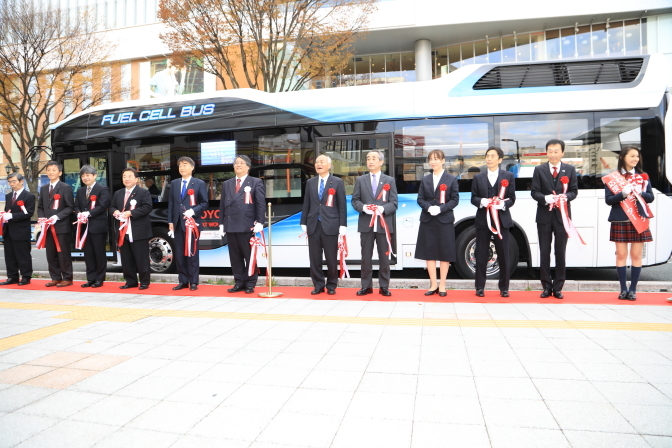 In test driving of the “hydrogen-driven fuel cell bus”, many participants commented about the quietness and comfort of the ride and speed of acceleration, and passengers were delighted to try out Fukushima Prefecture’s first (the second in Tohoku area) such vehicle. TOYO SYSTEM is committed to making contributions for the attraction and further development of battery industries in Iwaki City in future as well.